In the Globe and Mail out of Toronto comes a piece that describes that chefs are using acupunctured fish that enhance the freshness. 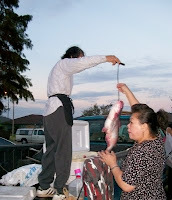 A needle insertion technique renders the fish paralyzed while it is being transported. The fish is alive although brain dead which keeps its flesh from decomposing.